Interest rates on almost everything have fallen since the onset of the financial crisis — long-term bonds, short-term bonds, fed funds, mortgages, car loans — pretty much anything with an interest rate attached to it. Well, everything except credit cards. The average credit card APR rose to it’s highest average ever in 2017 at around 16%. In some ways this makes sense. It’s an unsecured line of credit given out to borrowers with very little due diligence performed on their creditworthiness. But it’s also kind of crazy that as interest rates in nearly everything else have fallen, credit card rates haven’t budged at all. There are obvious risks involved for the companies giving these types of credit lines to people but there are also huge rewards. Visa has made nearly $14 billion over the past year. Mastercard has seen sales of almost $10 billion. And what’s good for these companies is bad for the personal finances of anyone carrying a credit card balance. According to a recent study from Nerd Wallet, that’s a lot of people. They found that the total outstanding amount of credit card debt is close to $905 billion in 2017, up 8% since the previous year (for comparison purposes — student loans have roughly $1.4 trillion outstanding while there is almost $9 trillion in mortgage debt in the U.S.). The average household carries a credit card balance of $15,654. This number does include people who diligently pay off their balance every month but it’s estimated that only half of credit card holders do so. 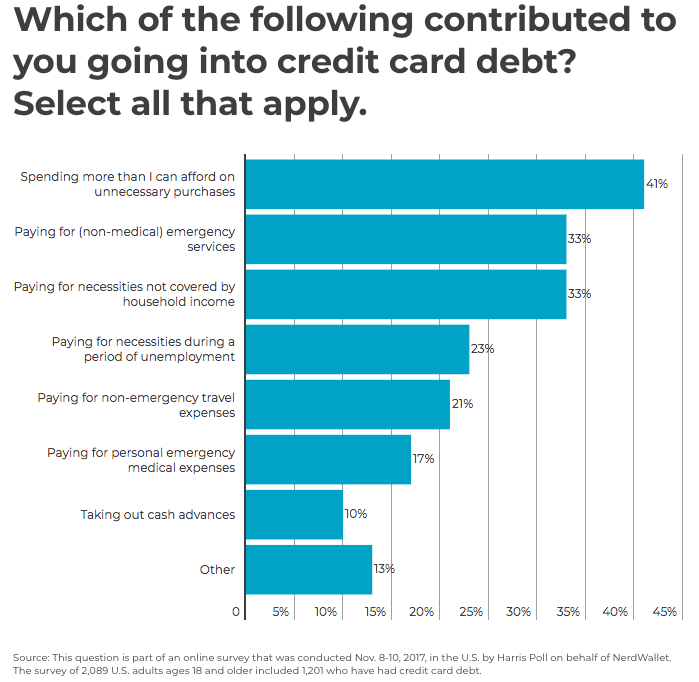 Households with revolving credit card debt pay an average of close to $1,000 a year in interest costs (the average balance for those who don’t pay their balance each month is between $6,000-$7,000). While that’s not a ton of money in the grand scheme of things if this is money that this group is not saving elsewhere it becomes a double whammy of negative compounding through an opportunity cost to invest for the future and paying interest to tread water. Credit cards make our lives more convenient in many ways, but this convenience acts as a double-edged sword. For example, I have an Amazon credit card but it’s not even a physical card. It’s basically just a line of credit through Amazon’s website that allows me to purchase anything I want on their site with the push of a button. It doesn’t even feel like spending money (although the 5% off every purchase is a nice perk). 1. People who pay off their balance each month and simply use a credit card for convenience and the ability to earn rewards on their purchases. This group doesn’t or shouldn’t care about credit card interest rates because they never have to pay them. 2. People who pay the minimum balance, have a hard time paying it down, and accumulate more debt over time. This groups should care about credit card interest rates because they have a negative impact on their wealth. I fall into camp 1 on this scale. I pay for everything with my credit card to earn as many rewards points as possible and then pay it off each month. I am also not ashamed to admit that I’ve hopped around from card to card over the years when there’s a nice sign-up bonus involved in the form of travel rewards or a cash payout or simply a card with better perks. I feel a bit like a free-rider on the credit card system in some ways but I guess it will always be like this. There will always be a large group of credit card users who carry balances that end up subsidizing those who don’t. It’s the same thing as investing in the markets where the mistakes of the losing investors lead to the spoils of the winners. Buffett’s first rule of investing is “you do not talk about Fight Club” “never lose money” (and the second rule is “never forget rule 1”). The first rule of personal finance is never carry a credit card balance. It’s another one of those simple to understand yet difficult to execute money management concepts for a large swath of the population. 3. How Much Do You Need to Retire?